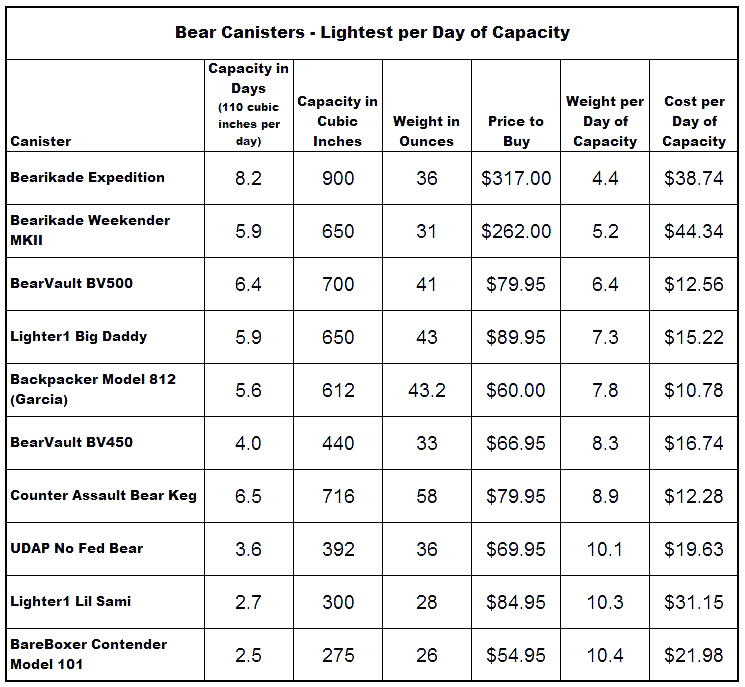 If you are going to thru-hike the John Muir Trail, you are going to need a bear canister. They may be heavy, unwieldy, and a nuisance, but they also are enormously effective. Which one should you use? There are two ways to look at it, depending on what you most want to avoid: pressure on the bottom of your feet or pressure on your wallet. The two tables, below, should help. By the way, links to all these options can be found here. UPDATE: The two tables have been updated to incorporate the lid and handle on the two Lighter1 canisters. Since the lid may be used as a pot and bowl the manufacturers do not include that weight into the canister. UPDATE 2: Please don’t look for a BearVault 550…there isn’t one! I should be BearVault 500. Sorry for the typo, and thanks to DM for spotting it! UPDATE 3: Small adjustment on the BareBoxer weight, and I added a graph! Want to save a few bucks? This table is for you. More interested in saving some ounces? Here you go! Hey Ray, Thanks as always for your informative articles. I thought it should be mentioned that you can rent the Bearikades. Very true, and get them made custom lengths as well. Thanks, Jack! I just picked up the BC-500 from E-bay for $48.00, new in the box. I wish I saw this prior. I think when I do my JMT hike I will get the Bearikade. Saving ounces on that long of a hike makes a difference. I’m with you, Gary. The lighter the better. Thanks for the comment! You can rent the BeariKade directly from the manufacturer, and apply your rental to the purchase price. Additionally, there is a 6 month wait. Should you buy one, you could turn around and sell it for as much as you paid or more due to enormous demand, and that 6 month wait. Sage to Summit in Bishop rents them, too. Very easy and nice to work with / only charges you for days on trail, per the honor system. The BV550 / 450 become a real pain over time to thread the lid into the grooves, especially when your hands are cold! All great points, Heather. Thanks! Hmm, thanks for mentioning those things, Heather. I’ve been reluctant to buy a Bearikade just because they’re so darned expensive (and I’m trying to keep my gear as cheap as possible while still keeping my load light). I didn’t really want to hassle with renting, and I didn’t know there was such a long wait. I also didn’t think about reselling it after the hike. I will have to take that into consideration now as I try to figure out what I’m going to do. One note about the custom sizes though…I’ve seen it mentioned elsewhere (possibly on the JMT yahoo group) that the custom sizes might be illegal, as only the Expedition and the Weekender are approved. Has anyone checked with the rangers about that? Here’s my take on the “custom size” question: if you ask a Ranger, chances are he or she is going to give you a by-the-book answer. Rangers, after all, do not have the authority to authorize new canisters. That said, I would be extraordinarily surprised if anyone was ticketed. I’ve never been asked to show my canister, and if I was, I doubt the Ranger would measure it. I would advise NOT to tell the Ranger that it is custom. That would put him or her in an uncomfortable position. Thanks for the comment, Jill. 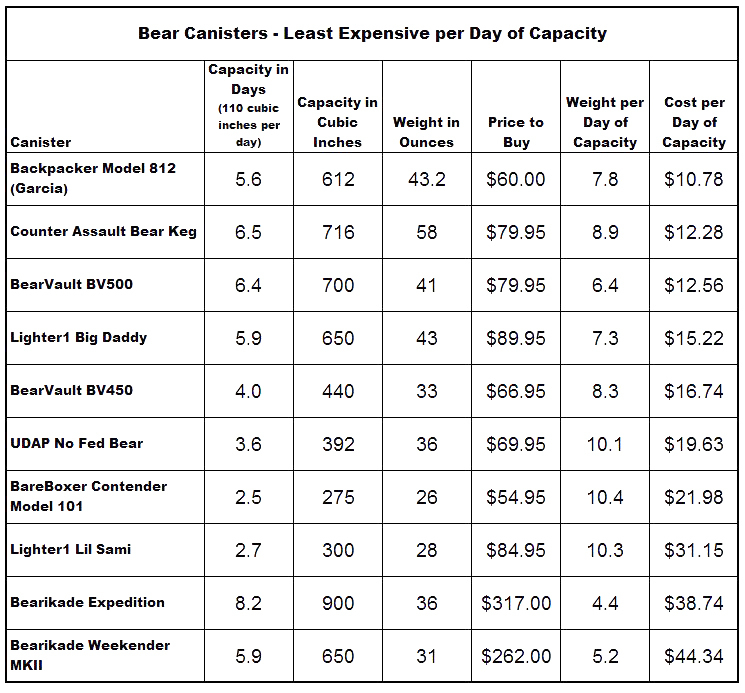 Wild Ideas has a JMT discount for their Bearikade rentals. I think it is about 40% off normal rental rates. The lead time for a Bearikade seems to vary dramatically during the year. I received a standard weekender in less than a month late last summer. Best to call or email. Wild Ideas is a small operation. Ray, the weights for the Lighter1 cans are a little misleading. Those weights are for the cans only, but you need the lid/pot and handle/brace for it to be a functioning bear can. I weighed mine and the pot weighs 7 oz (6oz claimed) and the handle weighed 1oz. So you would need to add another 8 ounces to those totals to get the true weight. Wow…I didn’t know that. Those scoundrels! I’ll try to make the changes as soon as I can. Thanks! Ray, unfortunately the weights listed for the Lighter1 canisters don’t include the lid or internal support. Their website seems misleading in that these elements at obviously required, even if they do serve other purposes. The 36 and 21 ounce weights are for the polycarbonate shell only. Yep…just learned that little fact. I hope to make the changes today or tomorrow. Thanks! Tables have now been updated with the true weights for the Lighter1 canisters. Thanks! Thanks for the updated info Ray. I purchased your book a few weeks back and can’t remember a time when the author does free updates rather than making a new edition. Much appreciated. You are very welcome, Leland. A substantially expanded new edition is in the works, but won’t be out for about two years. A different (non-hiking) book is taking all my free time! Thanks for the comment. That’s a great table to share. I’m a big proponent of bear cans, due mostly to my own incompetence at hanging. One error: the weight of the Bare Boxer 101 is 26 oz. The manufacturer specifies it as 1.6 lbs = 25.6 oz. Mine weighs in at 26 oz even. I prefer to think of the question not in terms of “lightest per day”, I think of it as: I need a certain volume for this trip; of all of the canisters out there, what’s the lightest can one I can carry? The answer is actually pretty simple. It’s the Bare Boxer until you exceed 275 cu^in, then the Bearikades (Scout, Weekender, Expedition) as your volume needs go up. In my opinion, given that, none of the other canisters are worthy of consideration. Of course, I prefer pressure on the wallet, not on the feet, as you put it. Thanks, Adam. I changed the weight of the BareBoxer. Appreciate the note! Not sure if I agree with your “what’s the lightest can one I can carry” approach, though. 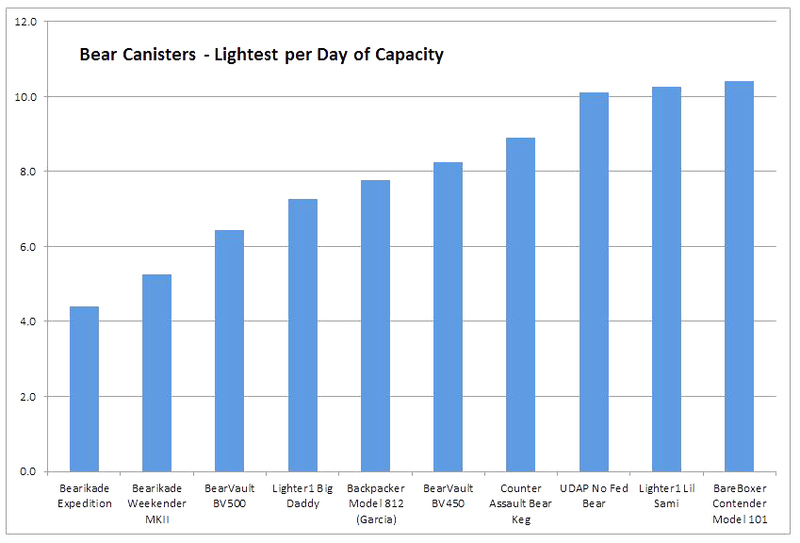 I think most people start with the lightest overall canister and then use it on a variety of trips. I would use your approach if I had unlimited funds, though, since it is obviously most efficient. I would just determine how big it needed to be and have the Bearikade cut me one to that size, for each trip! Well, I don’t have unlimited funds, but do have access to a variety of Bearikades. Many don’t have that! If I were only going to own/use one canister, it would probably be the Bearikade Weekender. My experience agrees well with your volume estimates, so the weekender would be good for about 7 days (first day doesn’t need to fit in the can). I’ve never gone 7 days in the Sierra without a resupply, although it’s certainly not outside the realm of possibility (especially if I ever get around to the Sierra High Route). The resale values on Bearikades is very, very good, and I expect it will continue to be (unless the Ursack is approved in the Sierra). Ray, are canisters required anywhere on the trail south of Yosemite NP? Thought about sending a bear bag to Red’s as part of my resupply and then mail the canister back to YNP (my brother-in-law leaves the hike at Red’s and could take care of that). I’ve been a fan of your book (got it a couple of years ago) and your blog. Thank you for doing it.